Fully Multi-Coated	- Anti-reflective lens coatings on every lens surface allow for brighter views. Unlimited Eye Relief	- Non-critical eye relief for rapid target acquisition. Parallax Free	- All red dot and holographic sights will exhibit some small amount of parallax. Matching current industry practice, this small amount would be considered “parallax free” and will make a negligible difference in the UH-1’s performance. Shockproof	- Rugged construction withstands recoil and impact. ArmorTek	- Ultra-hard, scratch-resistant coating protects exterior lenses from scratches, oil and dirt. Rear Facing Controls	- Easily power up and click through 15 levels of intensity. 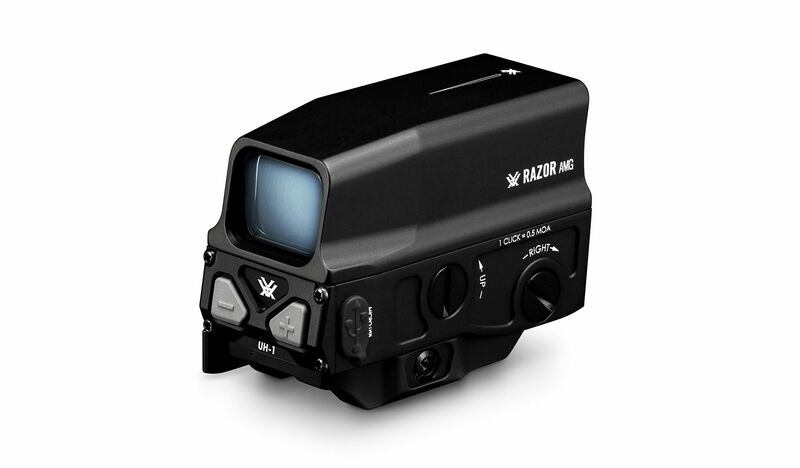 FHQ Technology	- Virtually eliminates stray light emissions for stealth-shooter-signature in low light and prevents eyepiece glare common to other holographic sights. Micro USB Port	- For use with LFP123A rechargeable battery. CR123A -	CR123A battery is included with the UH-1. This option will provide the best battery life for continuous use. LFP123A -	The UH-1 also runs on the LFP123A, the high-end rechargeable version of the CR123A. Charge the battery using the Micro USB port and it will recharge while in the sight. This battery does not have as long of life for continuous use as a standard CR123A, but does provide the advantage of recharging. RCR123A -	RCR123A battery. You can use this battery in a pinch. It is rechargeable, but it won’t take a full charge through the USB port and may fail after a couple of hundred rounds due to recoil and will not recharge. It will not damage the unit, but you will not get optimal performance from this battery.